Mumbai: The Serious Fraud Investigation Office (SFIO), the investigative agency of the ministry of corporate affairs (MCA), has initiated an inquiry into the initial public offering (IPO) scam that rocked the Indian stock markets in 2005, according to a senior official of the department. SFIO, created in 2003 as a multi-disciplinary body under MCA, deals with corporate crime. 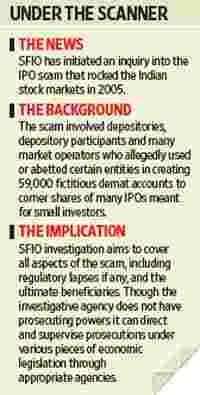 The scam, unearthed in April 2006, involved depositories, depository participants and many market operators who allegedly used or abetted certain entities in creating 59,000 fictitious demat accounts to corner shares of many IPOs meant for small investors. “In August, we wrote to the agencies asking for all the information required for investigation, but no one has responded yet," said the official. He declined to be identified as he is not authorized to speak to the media. In an email response to Mint, a Sebi spokesperson said: “As a matter of policy, Sebi does not comment on an ongoing investigation." Both RBI and NSDL did not respond to emails. The SFIO investigation aims to cover all aspects of the scam, including regulatory lapses if any, and the ultimate beneficiaries. The investigation office has also asked for records of all proceedings conducted by Sebi and action taken by RBI against non-banking financial companies involved in the scam. The department is scheduled to send its report to MCA by November for action. SFIO does not have prosecuting powers, but it can direct and supervise prosecutions under various pieces of economic legislation through appropriate agencies. “We have also asked for minutes of the allotment committee meetings, information on all the off-market transactions during that period and data on fictitious demat accounts," the SFIO official said. A demat, or dematerialized account, is mandatory for anyone wanting to trade in equities in India. When an IPO is over-subscribed, the basis of allotment of shares is decided by the registrar to the public issue, based on the recommendations of a committee appointed by the board of the company that is raising money from the public. The allotment committee consists of a few directors or the entire board. Earlier in April, the Sebi board had sought external legal opinion on orders issued by an independent committee against the country’s premier depository NSDL. There were differences within the board on whether the committee had exceeded its brief, which was to oversee Sebi proceedings against NSDL in the scam. The orders, issued by the committee in December 2008, found that NSDL had failed to meet applicable legal standards for duties and responsibilities of depositories. The committee also directed NSDL to conduct an independent enquiry to establish individual liability, if any. C.B. Bhave, the current Sebi chairman and the former head of NSDL at the time of the scam, has recused himself from the proceedings against the depository. During the investigations, Sebi had found that certain entities had illegally obtained IPO shares reserved for retail applicants through fictitious demat accounts. They then transferred the shares to financiers, who sold the shares on the first day of listing to benefit from the difference between IPO and opening prices. Ahmedabad-based Roopal-ben Panchal, allegedly the linchpin of the operation, is said to have opened several fake demat accounts and raised finances on the shares allotted to her through branches of an old private bank. It has been widely reported that she advertised free photo shoots in local newspapers and later used the pictures to create fake demat accounts to trade in the shares. 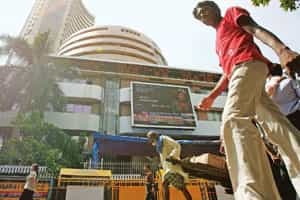 Sebi has investigated several IPOs, including those of Yes Bank Ltd, Infrastructure Development Finance Co. Ltd, Jet Airways (India) Ltd, Sasken Communication Technologies Ltd, Suzlon Energy Ltd, Punj Lloyd Ltd, Jaiprakash Hydro-Power Ltd and NTPC Ltd among others for possible abuse of the shares meant for retail investors. In November 2006, Sebi had ordered NSDL and a few others implicated in the IPO scam to return Rs115 crore in “illegal profits" made from the IPO deals. In an ex parte order, Sebi had said the depositories “failed to exercise oversight over the depository participants" and the promoters of NSDL and another depository Central Depository Services (India) Ltd were directed to take “all appropriate actions, including revamping of management". The Securities Appellate Tribunal set aside the Sebi order in December 2006 on an NSDL appeal, describing the regulator’s action as a clear “violation of the principles of natural justice". The appellate wing of Sebi, however, left it open for the regulator to initiate fresh proceedings. Sebi’s investigation of the IPO scam has been continuing. RBI, too, got into action after the scam was unearthed. In 2006, the banking regulator had fined nine banks for violating the know your customer norms, breaching prudent banking practices, and not adhering to directives and guidelines for granting loans against shares and IPO applications. The banks were fined for failing to show prudence in opening multiple savings accounts with one common name and multiple unconnected names. These savings accounts were used to open many demat accounts for making multiple applications in IPOs. N. Sundaresha Subramanian contributed to this story.